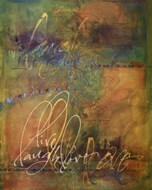 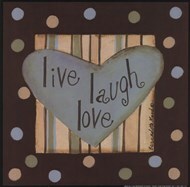 'Live, Laugh, Love' art is a form of inspirational print that has been adopted widely by modern audiences. 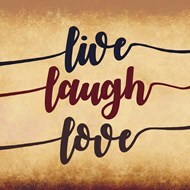 These contemporary graphic designs range from simple pictorial styles to more complex works of art and are generally meant to enhance the overall feel of a room rather than serve as a focus in and of themselves. 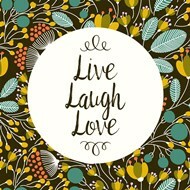 Unlike many inspirational prints, the message of 'Live, Laugh, Love' art is simple and can be interpreted in many different ways by the viewer. 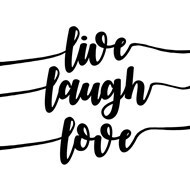 Because of this, some artists choose to further define the phrase, as seen in the sentimental print 'Live Laugh Love' by Karen Tribett. 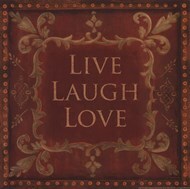 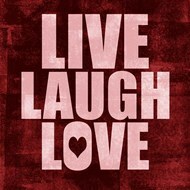 However, many 'Live, Laugh, Love' framed art simply contain the three words along with a background graphic, as shown in 'Live, Laugh, Love' by Bernadette Mood. 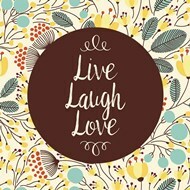 These modern pop pictures have been explored in a variety of ways, from rustic designs to contemporary graphic designs. 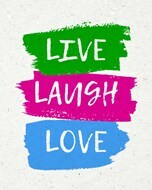 However, these works generally make the images as simple as possible in order to highlight the typography, which is often the primary subject of these inspirational prints. 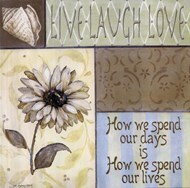 For many art audiences, the sentiments that are typical of 'Live, Laugh, Love' art are more than just a pretty picture. 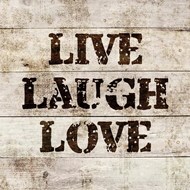 They are a reminder to embrace life to the fullest. 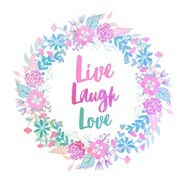 One example of this lifestyle theme is seen in 'Life is Good- petite' by Pamela Smith-Desgrosellier, whose work seeks to explain the 'Live, Laugh, Love' sentiment.